It's the beginning of the flower growing season and I've been resisting planting since November, promising myself that the plants will thank me for it and do better if I wait. It's been a struggle but at last the first seed sowing day arrived, with early annuals and perennials now carefully tucked up in the propagator. Since starting growing flowers for sale I've been slowly refining seed ordering, care and planting, trying to be more efficient, frugal and successful. All the advice says to keep seeds in the fridge but I can never manage that - too many seeds, the fridge is not big enough and I'd be taking them out all the time to look at them. I keep them in a plastic box sorted into perennials, biennials, hardy annuals and half hardy annuals, all nicely kept together with elastic bands, except when I'm sorting through checking that I have enough, reminding myself what the year is going to bring while a storm rages outside. Anytime - that lovely new seed I just can't resist! Some seeds are sown every month except December and January, working through the year to make sure that there are flowers at all times except the depths of winter. Higgledy Garden - the delightful and very informative Mr Higgs sells a good range of cutting garden seeds. They have very reliable germination for me and an entertaining growing guide is always available online. Seeds of Distinction - some unusual varieties, I'm trying Penstemon Chocolate Drop this season. Kings Seeds - offer a service for allotment and gardening societies and are very competitively priced. Great range of sweet peas. Owls Acre - sweet pea specialists who also sell winter varieites. Suffolk Herbs - herb specialists, my Hop seeds have come from Suffolk Herbs. Chitern Seeds - many different varieties, plus shrub and tree seeds. My germination challenges often come from Chiltern, when enthusiasm and optimism delivers seeds with a warning that they can take up to 2 years to germinate! Moles Seeds - as well as a comprehensive catalogue, Moles are working with Flowers from the Farm to provide specialist cut flower varieties that we can't get elsewhere. Thank you! I did cheat slightly in the seed sowing schedule by breaking into a packet a few weeks ago to prepare it for sowing. I'm giving Hops a go this year and they need to be chilled before sowing, so they were spread on wet kitchen paper, put in a plastic bag and tucked into the firdge for a month before being sown into seed compost today. There's a very clear guide to growing Hops written by Alys Fowler that I'm carefully following http://www.theguardian.com/lifeandstyle/2015/jan/17/hops-as-garden-plant-alys-fowler and it seems to be working. Two of the seeds had already started sprouting in the fridge (see picture above) and I remain convinced we'll be draped in hoppage by the end of the summer, all from teeny seeds - beer anyone?? When I started growing flowers for sale I started small and inexpensively. My plan was to grow everything from seed initially and see how it went. So during the first Spring I planted lots of seeds for the plants I thought I needed. As well as annuals, I sowed perennial seeds, knowing that most wouldn't be cut that year but would flower the following year - delphinuims, sidalcea, scabious, armeria and lupins all sprouted away and showed willing in a very chilly spring. Once they were through in seed trays they were potted on and grown in the polytunnel before being hardened off. Our land had been derelict and was covered in weeds when we first moved in and we'd made tentative attempts at clearing small areas, making a few beds for vegetables by ploughing and digging. The docks, couch grass and nettles were pretty formidable however and not to be underestimated. Any gardening book would tell you to clear any sign of perennial weeds before planting and I certainly tried. However, the old saying of 'one year's seed, seven years weed' is definitely true, never mind the dock roots that stretched to the centre of the earth and refused to be dug up. It was into this infested soil that my delicate little seedlings were transplanted and I stood back and watched them struggle. Some did well - the lupins (how I love a lupin! ), armeria and sidlcea did reasonably well and even flowered in that first late summer. Surrounded by a forest of docks and couch grass flexing its muscles the delphiniums and scabious sighed pitifully. Pot on more than once - a bigger plant will be able to fight off competition more easily and will be quicker to establish. Again, late summer/autumn sowing allow plants to grow but mean they can be planted out before the heat of the summer (heat + summer = artistic licence). Remove every single sign of perennial weeds from the soil. Painstaking work and can only be done by hand, but it makes a huge difference. Don't plant weeds - this my seem obvious but is worth the reminder. That tiny weed seedling in the pot may look harmless but get it out or it'll grow too, and faster by far than anything you actually want to grow. Feed your plants - regular liquid feed, compost or manure gives healthy plants, healthy plants fight off bugs and disease and give lots of flowers. Avoid landscape fabric - I used this for 2 years thinking it would save weeding time. However, the docks pushed their way through the holes right next to the plants and were impossible to remove, it was hard to apply manure, harboured slugs and bugs and became a total mess. Bigger plants, closer together and a juducious use of the hoe is a less frustrating and more effective strategy. Keep plants in groups, in narrow beds for ease of cutting and management. I'm now in the final stages of the Great Perennial Re-organisation, digging up those early years perennials and freeing them from the choking weeds that are restricting their potential. All established perennials, and some new ones, are being moved in blocks into 20m x 1m beds, carefully rid of weeds and roots, mulched with manure and are already pushing forth new leaves. While the annuals are still dry in the packets, perennials have set off on their way to Summer, never mind the ice and floods, and I have a shiny new hoe to keep those weeds at bay! Flower farmers are always looking forwards, even before the first frost blackens the dahlias we’re planting bulbs for the Spring and piling up seed catalogues ready for the next season. It would be easy to just keep on moving onwards but it’s important to find some time to reflect on how things have gone and look for learning points that can inform and improve growing in the next year. •	Refer to my notes of growing, weather, sales, good and not so good events, what's flowering when. I keep a notebook every year with a double pge for each week and scribble notes most days. The notebook lives down the side of the sofa so that when I flop down at the end of a busy day i can just reach over and catch up without moving. The blank pages tend to be when things have really whizzed away and I haven't had time to complete it, so even the gaps tell a story. •	Get my accounts up to date and look at income from particular varieties, what sold well, what was an expensive outlay, income versus expenditure. I admit to being very poor at keeping accounts up to date and it's always the last thing on my To Do list. Once it's done I find it really interesting though so should relly be more diligent. •	Collate feedback from customers – or send out a feedback form - I use mostly use email to communicate with customers so it's quite straightforward to gather information. •	Review social media posts to find what has been well received (favourites/likes), created comment, and recorded – social media can provide a very different record of the year in posts and pictures and it varies depending on the platform that's used. I find I post more of the day to day on Twitter so will more likely have info on disasters, challenges and irritations than on Facebook or Instagram. • Get together with others and discuss shared challenges and successes and what made them - email and online chats are great, #britishflowers Twitter hour is fabulous, but there's nothng quite like a group of flower farmers in a room talking seeds! While I'm reviewing it’s easy to think ‘oh that was good’ or ‘hmmm, not sure that worked’ but the most important element to look at it is WHY it was that way, was there anything that might have made it different, would another approach have made things better or worse? When trying to repeat a success or improve on a challenge if I can figure out the WHY, I'm well on my way! When I started to sell natural dyed silk ribbon I wanted to make the packaging as natural and sustainable as possible, but also make it add to the lovely feel and stye of the ribbon. I managed to source boxes and tissue made from recycled paper, created wooden pegs for the ribbon to be wound on from UK produced timber, and then looked online for hand made paper for the labels and wrapping. The most suitable paper was imported from Asia and I really couldn't find anything more local. Although I'm not averse to learning new skills, with flowers, campsite and ribbon-making I really didn't have time to become a papermaker, so I set about finding someone more local to make some paper. Eventually I found Alison who makes paper in Glasgow and she agreed to do a test batch, and also suggested adding petals to the paper - marvellous! The test paper was great and helped clarify exactly what I needed for the first batch. I couldn't be happier with the result, the paper is just gorgeous and I have to be seriously disciplined not to use it for everything! It takes printing beautifully and makes a fairly simple piece of text look very classy indeed. I used the paper to make a portfolio of flower images for markets and fairs and it created a fabulous look that is just right for Mill Pond Flower Farm. So I now have a good supply of locally made paper to use as labels and wrapping for Heirloom Silk ribbon, plus a bit extra to sell in the online shop. Very satisfying indeed. Ray keeps bees on our smallholding. He loves his bees and spends lots of time making sure they're fit, healthy and buzzing. I'm not a beekeeper, but I give a hand when needed and play my part by growing the flowers they love and eating the honey they produce. At this time of year bees are happily collecting nectar and pollen making honey and new bees. As part of their natural cycle they reproduce and swarm to divide the hive and create a new colony. When this happens it's ideal if the swarm can be caught and then it can be put into a hive rather than going off into the wild. Thankfully this time the swarm was in a place that was easily accessible so off I went to get suited up. I put on the white beekeeping outfit, checked carefully that there were no holes or gaps, lit the smoker and collected the skep that Ray had been saving for just this occasion. He bought a locally made straw skep in a bee auction a few months ago and was very proud of it! 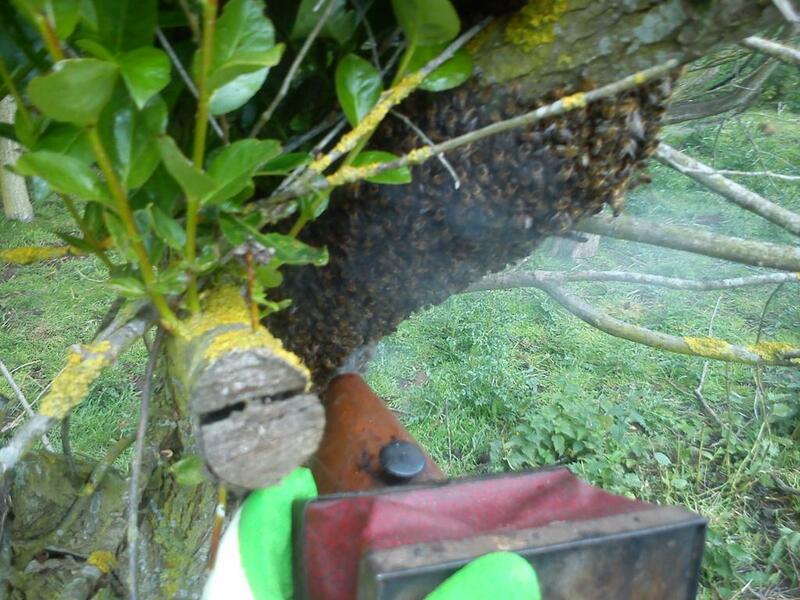 I put the skep on the tree above the swarm and spoke nicely to the bees. They didn't take much notice so I started to gently smoke the bottom of the swarm to encourage them to move up into the skep. 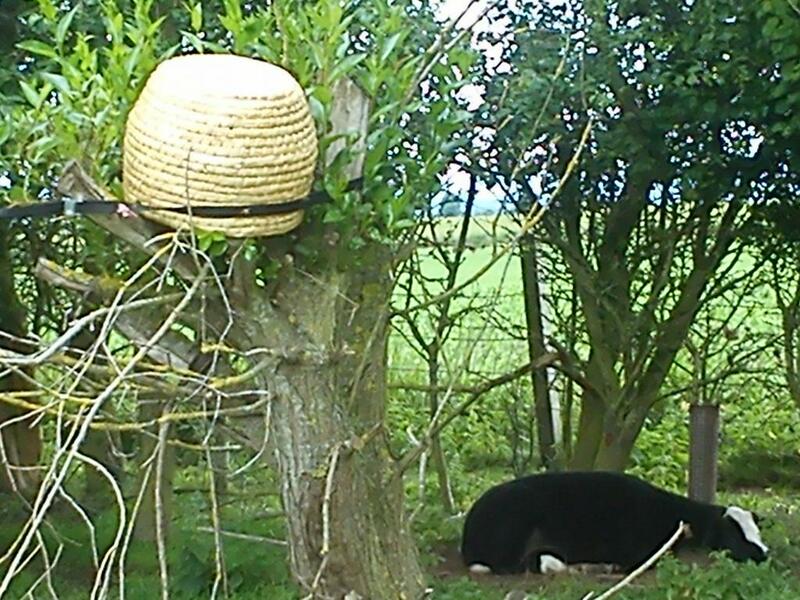 An hour later and they'd all moved up into the skep ready for Ray to pop them into a hive when he came home. It's the third British Flowers Week, with lots of activities taking place across the UK to celebrate and promote our wonderful home grown flowers. It feels like there is real momentum behind the campaign to get people filling their vases with UK grown flowers and it's great to be part of a positive movement, working with so many enthusiastic people. This week I'll be transforming the Scottish Enterprise building in Selkirk with flowers, talking to visiting florists and selling flowers and floral crowns at the Midsummer Market at Heart of Duns on Friday 5-8pm. I'll be leaving a few Lonely Bouquets around the borders for lucky people to claim and make their own. And there will be flowers for sale on the stall at the flower farm. Here's to a fabulously floral week! It's been a long cold and windy Spring and we've had a long wait for flowers in good quantities. But as the weather warms along come the lupins. Lupins are great cut flowers, amazing colours, fabulous shape, and they CURVE. So to celebrate the lupin season I made a bouquet specially to shoe them off - lupintastc! Sarah and Stewart got married! Last weekend I was lucky to be part of a fantastic wedding shoot, testing out some ideas and playing with different ways of approaching wedding looks. It was a great opportunity to try out using my flowers in a new style! We had a great time, experimented with clothes, flowers and hair, and had the run of quirky No28 Bar in Newcastle. Snowdrops have had a starring role in my photographs this week and they've shown themselves off nicely. Our snowdrops grow under the ancient sycmore tree outside the front of the house. It'svery large and pretty rotten at the centre. Theory has it that lightning took off the top branches apart from one. We did a bit of tree pruning last year with the help of a loaned Manitou and our lovely neighbour Stephen and removed the final long branch as it was very rotten and I was worried it would drop onto the school bus - not good for community relations at all. The snowdrops grow happily underneath and are the very first sign of Spring on its way. Here they are with the new pale colours of Heirloom Silk ribbon, all delicate and soft, which must mean Spring is just around the corner.